A virtual disk (vDisk) is a specialized variation of the cloud storage device mechanism that exists as a single file or a set of files split into smaller parts that represent the virtual server’s hard disk. A virtual disk is the consolidation of hard drives that are allocated to a virtual server before or after its creation. Each virtual disk is stored in a single file, or set of files, in the format that is supported by the hypervisor. Virtual hard disk files can be split into smaller parts. Although splitting the files speeds up the relocation process of the virtual server files, the virtual server’s performance tends to be negatively impacted as well. A virtual server is created with two hard drives. One has 300 GBs and the other has 500 GBs. Two virtual disks are created in the virtual server’s folder. One has 300 GBs and the other has 500 GBs. If Microsoft Hyper-V is used, the virtual disks will be stored in a .VHD file format (VHDX on Windows 8). If VMware ESX(i) is used, the hard disks will be stored in a .VMDK file format. 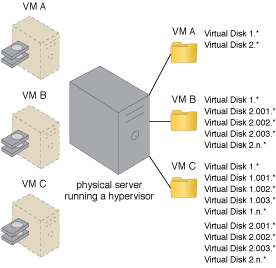 Figure 1 shows three virtual servers, each of which has two virtual hard disks. A single-file hard disk is used for VM A, hard disks split on VM B and a mixture of both applied to VM C.
VM A and VM B are virtual servers, but VM C is not a virtual server. However, this is common between virtual servers. (*) represents the format of the virtual disk files, which is determined by the hypervisor. The use of number sequencing is strictly for this example. The hypervisor may support different file-naming formats. Splitting disks can result in performance issues and is not recommended for disks that are larger in size. VM A has 2 virtual hard disks stored as a single file. VM B has 2 hard disks. One is stored as a single file and the other as a split disk. VM C has 2 hard disks stored as split disks. Figure 1 – An example of virtual disks.